Welcome to Day 1 of CAS-ual Fridays Stamps Sneak Peek Week!! We have the fabulous Karen Baker getting inky with us today! She has been such a tremendous help to me. As you may know, she is the designer of all my blog headers, and just wait til you see the packaging that she put together for me! I was going to introduce her as an honored guest, but guess what?? She's coming out of retirement to be a Girl Friday again! I told you this would be an exciting week! Today I get to share with you some amazing creations using the very first set I designed. I love word play, puns and silly sentiments. This set is a fun play on words, or maybe I should say a fun play on letters! 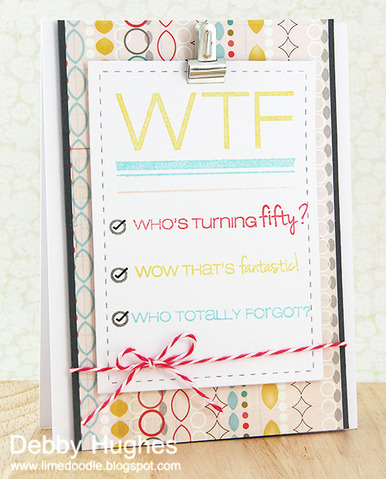 Can you imagine the initial gasp this card would get and then all the laughs?! I love the little check-off list and all the fun colors! This is pure fun folded in half! and the stitching is a yummy touch! Wouldn't this be a fun party invitation? Love how she paired her Cameo cut letters with the fun sentiment! Who wouldn't love to receive a card like this to celebrate some special news?! This set is super versatile and can put on a straight face when needed. I just love the beautiful papers that Suzanne chose. and the placement of those random gems is awesome! I just love that Karen used CAS-ual colors!! 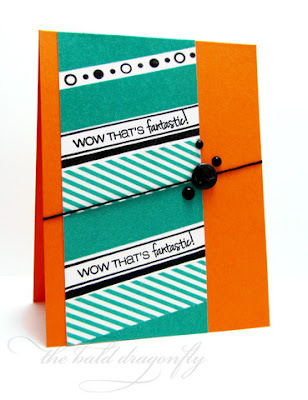 I love the way she used the dotty background stamp! Wow, that really is fantastic! 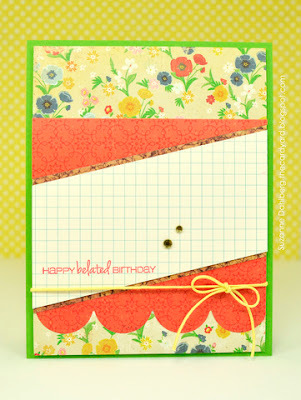 You can create your own pattern background using any of the 4 border strip stamps. Glittery stickers or even chipboard numbers make a fun focal point for the sassy sentiment. On the inside you can write "Not you!" LOL! In the meantime, please meander over to our blog sidebar and become one of our CAS-ual Friends. You can also grab our button for your blog to help spread the word about us. I enjoyed reading your comments soooo much last night! A few of our international friends asked about shipping, so let me take a quick second to tell you all about that. CAS-ual Fridays Stamps orders will be shipped via USPS first class mail. My goal is to have your packages mailed by the next business day! We'll be back tomorrow, same time, same place with awesome inspiration from the next set! What do you think its name might be? is this stamp set cool or what?! This one is a must have i tell ya. LOL at Laurel's comment...good one!! Hilarious! Love this and Laurel Seabrook's comment! Lol! A very fun 'tongue in cheek' set!! lovely samples ladies! Great set, can't wait to see more. Way too fabu!! The DT rocked it and I just LURVE this set already!! WTF.. what a fantastic set... beautiful usage of the sentiments and such a versatile set... quirky and fun...!! WOW, Just superb..I loved the play on the acronym...Too good. DT Samples rocked!!! Cannot wait to get my hands on this set. that stamp set is hilarious! so fun and clever! This is so hilarious! I love love love it!!!! And super awesome DT creations... Love it!! Too funny...love tbe sentiments. Let's shock some people to think twice. What a totally fun set! Love all the DT samples. So far looks to be a set that would certainly give some laughs! Congrats Michele! These cards are so much fun! I always think of WTF as "why the face?" (from an episode of Modern Family), but your options are much more useful for cards, especially "who totally forgot". That one is a must-have for me! When I first saw those letters, I was in shock (only because someone showed me a post on FB that caused them to hide that person as a friend). Glad to see so many different options for this acronym. Eager to see more as the cards here are all so different and classy. WTF! Wow These are FAB!! LOVE the stamps and the cards are all FAB! I love this set and all of the samples! They are GREAT! And I love your shipping charges! So low and much appreciated! Love it love it love it! You certainly got my attention with WTF, ha ha. Amazing sample cards. Can't wait to see the rest. ... So smArt! Just love it! Thanks for the chance! Wow this is such a fun and funky set! Love the cards your DT have made with them so far! Congratulations on your new venture~! Your first set looks to be a Winner That's Fabulous! congratulations on your new branded stampset. very clever idea as WTF. lovely cards. excited to see the upcoming inspirations. ok TOTALLY awesome!! i "need" this stamp set!!! WOW! I loved the first cards then the the "Straight" cards just blew me away great job. This is so funny and clever and hilarious! LOVE!!! Hahahaha!....I love this set....too funny!! :) I must say too, all the cards are fabulous! This set is so clever!!! And the DT showcased it perfectly. So much fun! that's funny! Yep, this set will turn a few heads! LOL!!! this set is so funny... love the DT work. The DT really did this set justice! It is such a cute set. I can't wait to see the rest of the release! Gorgeous set and so clever - love the versatility. Thanks for the chance! I nearly choked on my cuppa when I saw the first card, I couldn't believe my eyes! Love all the alternative phrases (they help to banish my immediate thoughts :). Can't wait to see the rest of the release! Awesome cards!!! Can;t wait to see all the sets!!! Wow - That's Fun!! I need this set now - my brother law turned Fifty yesterday, and I forgot to make/send him a card!! I can't wait to get my hands on this!! Wow this set is so cute and versatile! I love what the DT came up with. I also love your shipping... so glad you are enjoying this experience I am sure it will be a huge success. Congratulations! How exciting and what a great first set! Brilliant. I can see using this set. My mom would just flip, at first. Love it! Congratulations on this new venture! Love this! Seems like I've been waiting forever for stamps like these! Great sentiments...love the samples too. wow amzing stamp set..waiting for new inspirations!! It grabbed my attention! Love it! Love this! What a clever stamp set! I love this set, hilarious sentiments in it! Congratulations, so excited for you and excited to see the rest of the release! OMG what a GREAT sentiment!!! Love the inspiration! Love this set -- so perfect as a lot of my friends are..... yeah you know :) Thanks for the opportunity ti win. Such a cool fun sentiment, got me smiling. Great job on the first release!!! Too cute! I can so see myself using these. Can't wait to see the other sneak peeks. Fantastic funny stamps! Love all the example cards. congratulations on your first stampset! Hahaha. Totally caught me off guard! Love everything about this set! Hope it's me! 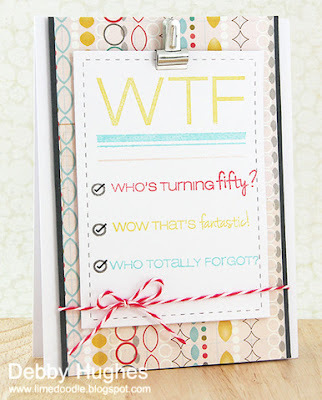 Love this tongue-in-cheek approach to stamping. Great way to start your very first release. Congrats! These are FABULOUS!!! I love them! OMG . . . WTF (want that flippin'-stamp)! Michele, what a cute and clever name for this fun set! Love how many different ways you can use it - so versatile! Michele congrats and good luck on your new venture! I love a Pun-ny card...very, very clever stuff. The designers did you proud! Ahahahaha! Love this set! It will definitely be ending up in my inky little fingers! So fun! Congrats on creating your new line of stamps...I'm excited to see the rest! I love your irreverent acronym and the very usable sentiments that go along with it! Thanks for keeping it light and fun. Congrats again on your super awesome news! Congratulations on this new path you are taking! If this set is any indication, you've got a huge hit on your hands! I love puns, and I'd love to play with those stamps - can't wait to see what else you'll come up with! Congratulations on this release which already looks totally fabulous. I love the tongue in cheek WTF but also that it is versatile enough to be used more seriously. And how many stamps are in this set!? It looks like a ton. I am so excited to see what else you have in store and plan to order on the 26th. Btw your shipping rate is awesome too! It means I don't have to feel like I need to "save up" an order of multiple things. Though I think I might be ordering more than one anyway! WTF??? I laughed out loud! Great idea for funny stamps. I am lovin' what I am seeing! Can't wait to see more sneaks! Oh, these are so much fun! Can't wait to see the rest. how exciting!!! you're starting off fabulous! This has got to be the trendiest stamp set to come along this year! I love that you weren't afraid to tackle those "feared" 3 letters and turned them into some PG rated cards! I just LOVE the whole concept! Bravo!! This is so thrilling! I love this play on WTF! 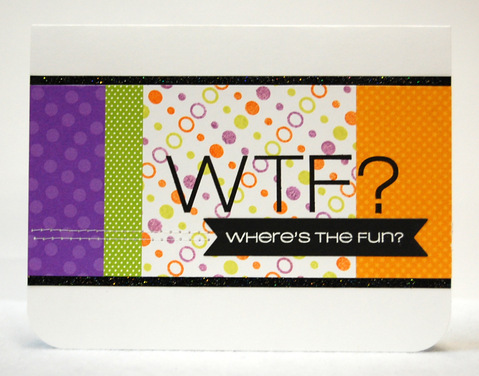 Fun and fabulous WTF stamps! What a cheeky wee set!! And thank you so much for reasonable shipping charge s -- certainly an incentive to order! How fun is this stamp set and great cards from the DT! Oh, the "WTF" is a HOOT! Aside from the not-so-polite phrase that popped into my head, the next thing I thought was "Wednesday, Thursday, Friday" LOL! Cute set. Good luck with your new company. Yay! Finally, someone willing to step outside the box and create some stamps with a bit of an edge! You definitely grabbed everyone's attention with this inital release! Awesome marketing strategy....you have the audience on the edge of our seats! Excited to see what's next! I'm thinking tomorrow's release is probably OMG. Right? Wtf, such a fun set! Congrats on your new endeavor! Congratulations!!! Can't wait to see more!! Such a fresh new set..........a definate must have!!! What's next! Thanks for the postage info for us 'other side of the world' stampers too! love the set! can't wait to see what is next! Liking what I am seeing! Can't wait to see more! so far i've saved two of this cards as inspiration- designs i try to create and now i can see what im really trying to achieve! Such fun and so different and just have to have them. Can't wait to see what else you have in store for us. Michele - this is so fantastic! I love it. I totally can't wait to purchase your first sets. Congrats. Michele this set is so much fun! Can't wait to see more and look forward to your store opening!!! Love all the cards.. and in love with the WFT Way To Fab! Oh, I so LOVE this stamop set....it is my quirky sense of humor to a "T"....thanks for the chance to win! What a fun set!!! I LOVE the quirkiness of it! Thanks to my friend Sandi for sending me over to check it out. Thanks for the chance to win! Congratulations on your new stamp company! I can't wait to see what you have in store for us! What I love the most about this stamp set is that it is like nothing else on the market! Super fun! Cute cards! This is such a fun stamp set! Wonderful sneak peaks! I do love Suzanne's card! Looks great, I look forward to seeing all your new creation such an exciting time introducing a new collection !!! It is great to see Karen's CAS cards here again! I love the DT cards! Just fabulous! Love all the cards and this set is really cool. Thanks for the chance to win it! The design team has outdone themselves with this unique set, Michele! Such clever sentiments and that dot background is fabulous! This would be such a fun set to win. Thanks for the chance!! hahahaha funny! i would love to have this set! This is laugh out loud hilarious! LOVE it! I want this bad! I'd love to see the look on the recipients face when they saw the card and then realised the pun. What a fabulous set love all the DT cards and would love to win this set! Who would have thought that there were so many "appropriate" WTFs??!! How wonderfully creative!! LOL!! Such a fun set! Cute! I can see this causing some people drama in the future when they have to convince people they didn't mean WTF in the more traditional sense. ;D DT, great samples! This is truly a fun set. Can't wait to send some cards using this set. FUN FUN FUN!....can't wait to get inky with this set! Where's The Fun? Right here obviously! Very clever set! WTF? I love it. Grat set of stamps. I can't wait to get them. This set makes me laugh..so much fun. I had a good laugh on this sentiment, haha. I already see so much fun to work around this sentiment. Congrats to this new stamp release. Love your new set!!! Super cute, can't wait to get them and ink those babies up!!! Love this set I hope i win it ...lol but if not I will have to buy! Lots of giggles here! It must have been a ton of fun designing this set! What a clever set Michelle. When my son says WTF I don't think he means WHERE'S THE FUN...hee. Love your take on it. Can't wait to see your full sets. WTF?!?! What thoughtful fun!! I love all the sentiments you came up with for WTF. Too funny puns, Michelle! Congratulations on your new stamp company!! i want i want the fun !!! What a fun set. Such fun cards. Congratulations on this venture. It looks fun and creative. I'm sure your stamps will be a hit! What TREMENDOUS Fun your stamp set is! The stamps are well beyond clever (and versatile - big score on that!!) DT ideas rock; your shipping rates means I'm "sold" already (can't wait to start making my shopping list); your inspiration is contagious. Congratulations on EVERYTHING!!! Gorgeous samples! What a fun stamp set! WTF ~ Wow, Terrific & Fabulous! How fun is this stamp set, love the play on words! Well, the name of these sure got my attention...lol...another fun~fun set for sure!! Nice turn on the WTF. Wow that will get your attention. Too fun and funky! It's on my wants and gimme list. That would be so fun to win! Oh my...Love this so much! Totally want this set...and all the new sneak peek stamps so far!!! Love the play on words. WTF!! So versital with endless possibilities! Thanks and good luck and congrats. OMG!! Love this one! Awesome! I can't wait to send these kinds of cards out to my friends and family! hehehehe! I LOVE the WTF! Awesome! Way to go Michele!!! How exciting! I love the look of these stamps, and wish you much success! Looks like you're off to a great start. I'm loving the examples. I seriously LOVE this stamp set! I could totally see myself creating a sarcastic card for my best friends when something stupid happens in their lives. What a great pick me up it would be! !